Whereas work measurement is concerned with how long it takes to perform a specific task or activity, work sampling is primarily concerned with how workers spend their time among several tasks or activities. For example. we may want to know how much time workers spend on indirect activities such as material handling to determine whether or not more cost-efficient material handling equipment should be purchased. In a hotel reservation call center, we would want to know what percentage of time is actually spent on the telephone. Work sampling' provides us with a method for determining the time spent on these activities, and involves observing a portion or sample of the work activity. 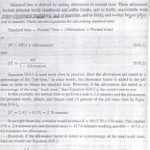 Then, based on the findings in this sample, some statements can be made about how the employee or employees spend their time. For example, if we were to observe a fire department rescue squad 100 random times. I. 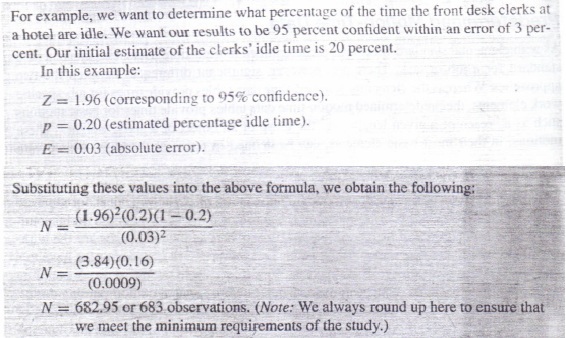 What level of statistical confidence is desired in the results? 2. How many observations are necessary? 3. Precisely when should the ob reservations be made? The number of observations required in a work sampling study can be fairly large, raisins from several hundred to several thousand. depending on the activity and the desired degree of accuracy. The formula for computing the required number of observations. N = Number of observations to be made. Z = Number of standard deviations associated with a given confidence level. p = Estimated proportion of time that the activity being measured occurs. E = Absolute error that is desired. 1. Identify the specific activity or activities that are the main purpose for the study. For example. determine the percentage of time equipment is working, idle, or under repair. 3. State the desired accuracy in the study results. 4. Determine the specific times when each observation is to be made. the number of observations if appropriate. The number of observations to be taken in a work sampling study is usually divided equally over the study period. Thus, if 500 observations are to be made over a la-day period. the observations are usually scheduled at 500/10, or 50 per day. Each day's observations are then assigned a specific time by using a random number generator. The need to divide the observations equally over the data collection period is even more important in service operations, where workers can be extremely busy during certain periods and less busy at other times. There has been a long-standing argument that a large percentage of nurses'· time in a - hospital is spent on non-nursing activities. This, the argument goes, creates an apparent shortage of well-trained nursing personnel, a significant was of talent, a corresponding loss of efficiency, and increased hospital costs because nurses wages are the highest single cost in the operation of hospital. Further, pressure is growing for hospitals and hospital administrators to contain costs. With that in mind, let us use work sampling to test the hypothesis that a large portion of nurses' time is spent on non-nursing duties. Assume at the outset that we have made a list of all the activities that are part of Assume at the outset that we have made a list of all the activities that are part of nursing and will make our observations in only two categories: nursing and non-nursing activities. (An expanded study could list all nursing activities to determine the portion of time spent in each.) Therefore, when we observe nurses during the study and find them performing one of the duties on the nursing list, we simply place a tally mark in the nursing column. If we observe a nurse doing anything besides nursing, we place a mark in the non-nursing column. Solution We now can proceed to design the work sampling study. Assume that we (or the nursing supervisor) estimate that nurses spend 60 percent of their time on nursing activities. 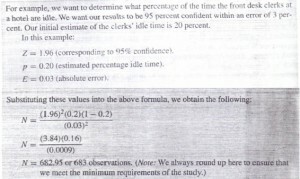 - Also assume that we would like to be 95 percent confident that the findings of our study are within the absolute error range of plus or minus 3 percent. In other words, if our study shows nurses spend 60 percent of their time on nursing duties, we are 95 percent confident that the true percentage lies between 57 and 63 percent. Using the above formula, we calculate that 1,025 observations are required for 60 percent activity time and 3 percent error. If our study is to take place over 10 days, we start with 103 observations per day. If we refer to a random number table and list three-digit numbers, we can assign each number to a time. The random numbers shown in Exhibit S 10.9 demonstrate the procedure for seven observations. This procedure is followed to generate 103 observation times, and the times are rearranged chronologically for ease in planning. Rearranging the times determined in Exhibit SlO.9 gives the total observations per day shown in Exhibit SlO.lO (for our sample of seven). To be perfectly random in this study. 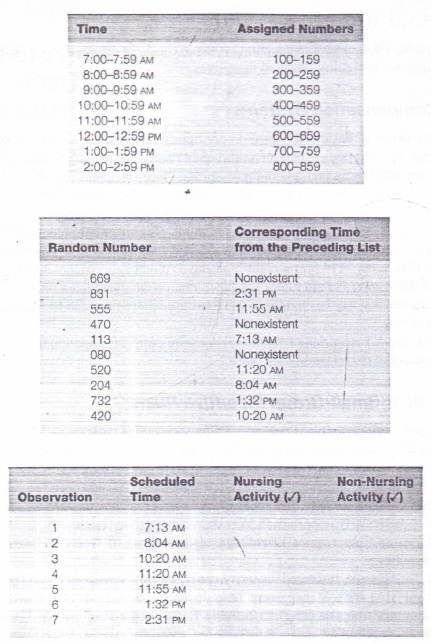 we also should "randomize" the nurse we observe each time (the use of various nurses mini miles the effect of bias). In this study. our first observation is made at 7: 13 A\f for Nurse X. We walk into the nurse's area and check either a nursing or a non-nursing activity, depending on what we observe. Each observation need be only long enough to determine the class of activity in most cases only a glance. At 8:04 AM we observe nurse Y. We continue in this way 1O the end of the day and the 103 observations. At the end of the second day (and 206 observations), we decide to check for the adequacy of our sample. Let's say that we made 150 observations of nurses working and 64 of them not working, which gives 70.1 percent working. Again, using the formula given above, we calculate that the required number of observations is now 895. Inasmuch as we have already taken 206 observations, we only need to take another 689 over the next eight days or 86 per day. Thi recalculation of the sample size should be done several times during - the data collection period. If at the end of the study we find that 66 percent of nurses' time is involved with what has been defined as nursing activities, there should be an analysis to identify the remaining 34 percent. Approximately 12 to 15 percent is justifiable for coffee breaks d personal needs. which leave 20 to 12 percent of the time that must be justified and compared to what the industry considered ideal levels of nursing activity. 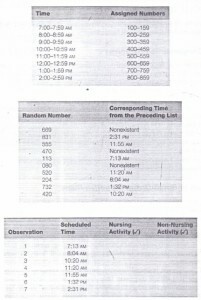 To identify the a-nursing activities. a more detailed breakdown could have been originally built into sampling plan. Otherwise. a follow-up study may be in order.